Bullfighter Sylvan La Cross rushes in to distract an angry bull from a bucked rider. Bull riders are always on the razor’s edge of danger and it’s the job of the rodeo bullfighter to keep cowboys safe when they are flung off that edge. Bullfighters Sylvan La Cross, 28, and Travis Langan, 33, spent the past weekend protecting bull riders during the Mission Mountain NRA Rodeo at the Polson Fairgrounds’ Less Baldwin Arena. La Cross and those in his extremely dangerous profession make their full-time living by serving as a human shield between the cowboy who is hell-bent on riding an 1,800-pound beast for 8 seconds and the beast who has plans to the contrary. On Friday night, the importance of having La Cross in the arena was not lost on Casey Fredericks a cowboy from Busby, Montana. Fredericks found himself ragdolled into the dirt by his bull just mere seconds after the gate had opened. Before Fredericks had even touched the ground, La Cross had already hurled his body into the mayhem. The diversionary entrance gave Fredericks enough time to scamper to safety while the bull gave La Cross his undivided attention. “Thanks, you really saved my s---,” Fredericks told La Cross behind the chutes after the rodeo. 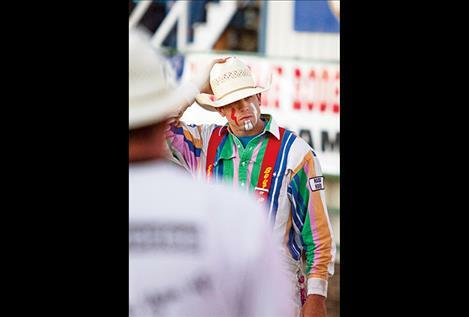 La Cross, a Great Falls cowboy, has been mixing it up with the bulls for about 12 years. He spent four of those years with the Northern Rodeo Association (NRA) and the last three year with the Professional Rodeo Cowboys Association (PRCA). For the bullfighter, injuries are a very real risk each and every time they enter the arena. Although equipped with a chest plate, a back plate, a rib guard, pants that come with padding for the hips, thighs and tailbone and a pair of cleats, the hits still come and so do the injuries. On Saturday evening, La Cross again inserted himself between cowboys and bucking bulls. 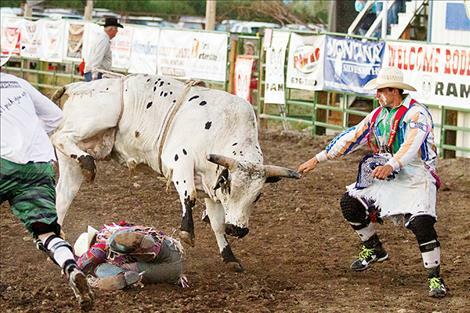 He managed to escape the Mission Mountain Rodeo without any serious injuries and so did a few bull riders.